The financial services industry around the globe is undergoing a disruptive, digital transformation and these 100 fintech influencers are at the centre of a growing online community informing these changes. they share a high-quality stream of relevant information. Some might ask: why a list? Here’s why. The pace of change in fintech is accelerating and specialized areas are evolving quickly, whether it’s insurtech, blockchain, mobile payments, or machine learning and artificial intelligence. It’s hard for anyone to keep up with current thinking and developments in all these areas. Global virtual communities – enabled by open, online social networks – are emerging as a strategy for staying informed and connected to the rapidly evolving thinking in these areas of innovation in financial services. Some people will also misunderstand the value of publishing such a list of fintech influencers. They will focus on the top 10 or 20 individuals, at the exclusion of the others. Yet, the ranking of these individuals would change significantly, depending on the criteria one uses to rank them. In my view, the real value and power of this (and any such) influencer list is to be found in the community as a collective – its ability to surface the most relevant news and insights in a timely manner and, on the flip side of the same coin, its ability to distribute ideas and awareness within a targeted group of people focused on related areas of interest. Thus, the individual ranking matter less than collective network effects of this group of 100 highly connected individuals. The original Fintech100 list was compiled and published back in late 2015 and updated with a larger list of fintech influencers in 2016. The 2017 list of fintech influencers has many familiar faces. As with the previous two lists, it was compiled using Little Bird social analytics technology, about which there is more information below. I have focused on individual fintech influencers, as distinct from organizations, largely because individual Twitter accounts tend to be managed directly by the individuals themselves. Now, before we get too obsessed with who’s on the list and who’s not, I want to explain the methodology used to compile this list. First, I relied on a commercially available social media analytics tool (Little Bird) which offers a powerful engine for crunching large volumes of social media data. The software compiles a list of online influencers that frequently communicate on topics related to “fintech” and then looks at the inter-relationships among these people. Emergence score is a calculation of how quickly someone is rising among the insiders. 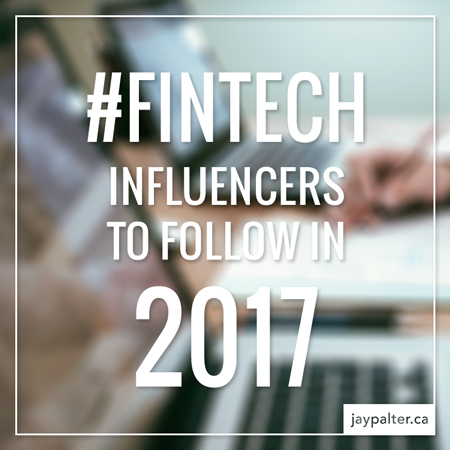 The Insider ranking was used to order the 2017 fintech influencer list. Second, I separated the results into individuals and organizational accounts. In most cases, this is easy to do, but there are some edge cases. In other words, sometimes the software mistakenly identifies an individual as an organization. I try to correct these manually, but mistakes are sometimes made. The point is that this is not the only credible list of fintech influencers online, but it is one of the best, in my opinion. How can influencer lists be useful? 1. Stay informed – Say you want to stay up to date on key issues being discussed within the fintech community, this is a good place to start. 2. Get known – Say you want to become better known within the fintech influencer community, this is a good list of people to pay attention to. Because the best way to get attention is to give attention – to pay it forward, as it were. 3. Engage the community – Say you want to get input, have a discussion or get the word out, these are key people to start with. They have an audience, they have reach and they are trusted. 4. Become an influencer – Say you want to get on this list and lists like this one, then a good place to start is to invest time in getting to know these people and building relationships with them (and a few hundred others). If you are an entrepreneur, a journalist, a startup investor, a potential customer of a startup, a potential buyer of a successful startup, an existing financial services business, a regulator, etc. (well, you get the picture) with an interest in the emerging fintech space, then this is a very valuable group of people to be paying attention to – and to get the attention of. If you are interested in discussing influencer strategies and their benefits for your business or yourself, we are offering a free consultation and customized list of influencers for your target industry vertical. Don’t hesitate to comment below or send me a private message at jay@palter.ca if you are interested in discussing further.